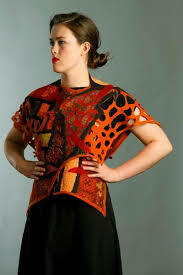 Feltmakers Ireland are delighted to welcome Catherine O’Leary from Australia to give a three day workshop in October. Check out her website on http://www.catherineoleary.com.au “This felt making workshop explores the different possibilities of felted garment designs. Creating intricate and original surface designs using nuno prefelts, each student will develop a pattern that suits her body shape. The main focus of this workshop will be on surface decoration and the manipulation of garment design”.